With his father, Charlie, and boyhood idol Bob Jones looking on, 23-year-old Jack Nicklaus served notice that Augusta National and the Masters Tournament would hold special places in his remarkable career. Jack Nicklaus came to the Augusta National Golf Club for the 1963 Masters Tournament as the reigning U.S. Open Champion. He had played in his first Masters in 1959 and, from the first, he loved the course because it set up perfectly for his game – power was a plus; second-shot accuracy was a premium. Add to the scenario that Bob Jones had been Charlie Nicklaus’ sporting hero, which he passed along to his son, and it didn’t take a genius to see that the stage had been ideally set for great things. Nicklaus opened with a 74 but rallied with an inspired 66 in the second round that put him just one stroke off the lead. 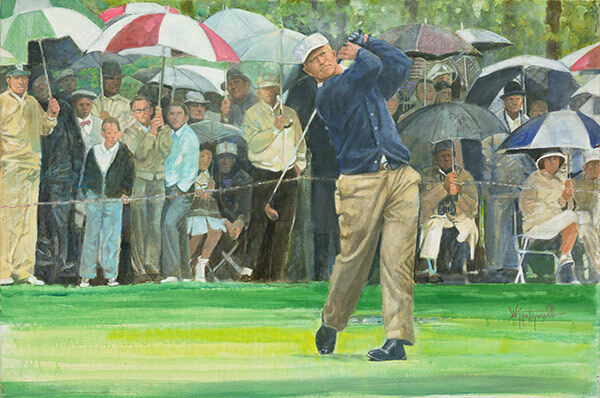 Then in a third round deluged with rain and unplayable by most standards, Nicklaus stood strong and eventually atop the leader board heading into the final round. His Sunday 72 withstood challenges from Tony Lema, who finished a stroke back, and third-place finishers Julius Boros, and the sentimental favorite, 50-year-old three-time champion Sam Snead, who was as much a part of the masters lore as the Magnolias and Azaleas.